Our active Communications Group produces our newsletter ‘Visions’, manages media contacts, runs our websites and social media accounts, and publishes our reports, booklets and pamphlets. ‘Visions’ is published in March, July and November of each year. It covers current and developing issues in the areas of planning and development, transport and travel; local community activity and City & County Council affairs. Each issue includes full details of our popular programme of walks, talks and visits for the coming 3-4 months. ‘Visions’ is available in print and online. Download the latest edition, or see all previous editions here. Our monthly eBulletin gives updates on developing news and upcoming events. 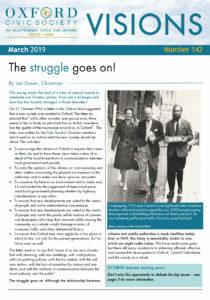 Over the years we have published a wide range of material on significant Oxford issues. See the Books and Pamphlets page for the list and more details. You can download a two-sided A4 description of the Communications Group here.